"Much of the previous work was performed with electrolyzers made from just two elements – one metal and oxygen," said Hong Yang, a co-author and professor of chemical and biomolecular engineering at Illinois. "In a recent study, we found if a compound has two metal elements – yttrium and ruthenium – and oxygen, the rate of water-splitting reaction increased." 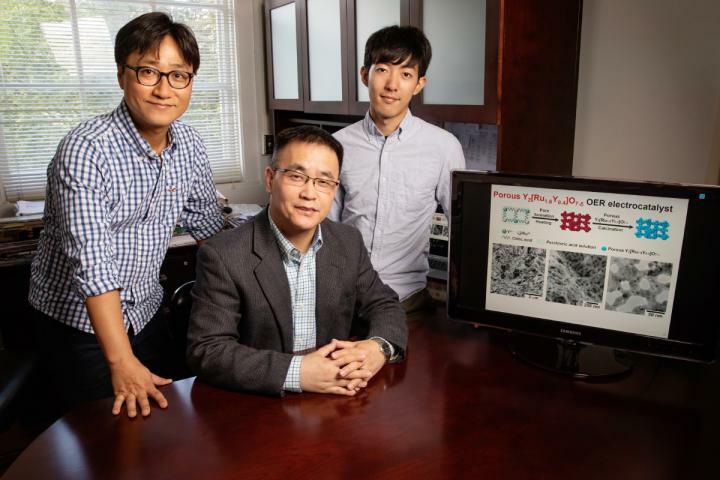 "The material became more porous and also had a new crystalline structure, different from all the solid catalysts we made before," said Jaemin Kim, the lead author and a postdoctoral researcher. The new porous material the team developed – a pyrochlore oxide of yttrium ruthenate – can split water molecules at a higher rate than the current industry standard.